I, like a lot of us have quite a bit of recycling in my recycle pile. I have to admit I had not been saving any of these things for the most part. I seen this list of ideas and I thought it was fantastic. 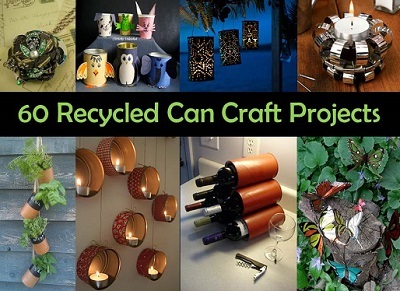 There is some really great creative things to do with recyclable tin cans so I will be saving mine from now on. Have a look through as I am sure you will find something that you love. It is always best to use reusable bags but when you cant seem to avoid getting those pesky plastic bags, you need somewhere to keep them so they don’t get thrown into the garbage. Remove the lid of the coffee can and set aside. If you are using spray paint, on a covered work surface, spray the can evenly and allow the paint to dry overnight. Close the lid and fill the can with bags by pushing them down through the cut star, leaving the last bag sticking out slightly. Pull the bags through the top or add more by pushing them down through the top.